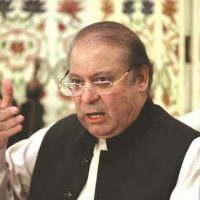 Islamabad police have registered a first investigation report (FIR) against five persons, including the security guards of Pakistan Muslim League – Nawaz (PML-N) supremo Nawaz Sharif, for assaulting a Samaa TV cameraman on Monday. TV footage had showed Syed Wajid Ali, the cameraman, lying on the ground outside the parliament building after a security guard allegedly shoved him for getting in the way of Sharif while recording footage of the politician. Another guard was then seen rushing towards the cameraman and kicking him in the face. The guard then leaves in one of the vehicles of the protocol. The cameraman, who lost consciousness in the attack, was taken to the Pakistan Institute of Medical Sciences (Pims). According to doctors, Ali sustained injuries on his lip, where he was administered three stitches, and on his head. The FIR names three guards from Sharif’s convoy and two unknown assailants. The case has been registered under Sections 355 and 506 of the Pakistan Penal Code. According to the FIR, the cameraman said that he was attacked by two security guards while he was trying to take photographs of the former prime minister leaving the parliament building. “I became unconscious as a result of the (attack),” Ali is quoted as saying in the FIR. The incident happened in the presence of Usman Cheema, Wahab Kamran, and other journalists, the FIR added. Later, two of Sharif’s guards – identified as Mansub and Mohsin – were presented before a civil judge, who remanded the duo on judicial custody for 14 days. Sharif, while speaking to the media, described the incident as unfortunate and assured that “every measure will be taken in accordance with the law”. The former prime minister regretted the incident but claimed that the assaulted cameraman had first hit his guard with his camera. Elaborating on the incident, Sharif said that his chief security guard, Shakoor, was clearing the path for him as they headed for the car when the guard pushed the cameraman out of the way. “I objected to the way [the cameraman] was pushed out of the way … [and then] the cameraman hit Shakoor’s forehead with his camera. Shakoor’s forehead started bleeding,” Nawaz told reporters. “I said, no need to react. I saw the [cameraman] getting pushed, my guard getting hit, after that I don’t know what happened, I was leaving,” the former premier said. “I will aid the investigation into the matter in every way possible, and I will also take action against the guards who are involved in this,” the PML-N supremo said, adding that he would never want to hurt the people who are reporting about him and his family “in this difficult time”. Speaking to journalists at the accountability court, he said that the incident should never have taken place.